Light aroma of dried dark fruit, ripe berries, malt and caramel from the pour. 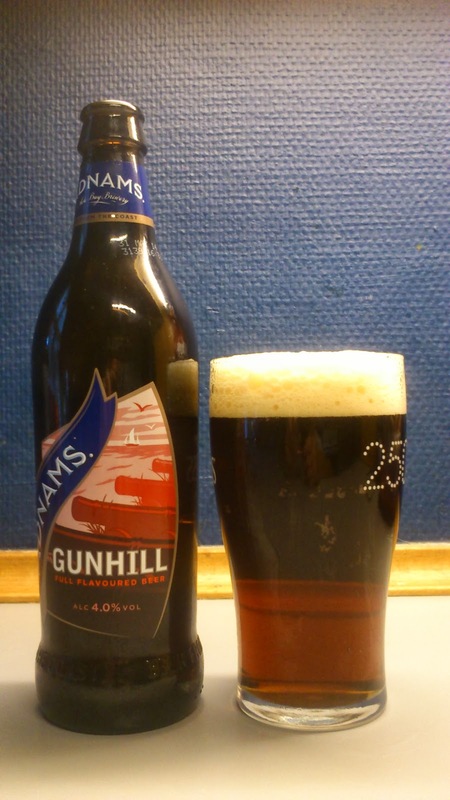 Gunhill pours clear ruby red with a creamy off-white/light beige head. Mildly sweet malty intake with dark fruits, chocolate and a dab of caramel while the dry finish has a light bitterness to it. Medium carbonation, the body is light and has a thin mouthfeel. A very nice looking beer in the glass. I could have just wrote one word above to cover the whole lot, mild. It is mild in every sense of the word, nothing is out of place and it is all a bit too subdued for my own personal liking. Saying that, it is very easy drinking and I'd have no problems knocking back a few pints of this on a small afternoon session. It says 'full flavoured' on the bottle, that is something I am in complete disagreement with. Summing up, mild. This scored 5.5/10 on the 'if it was only scored on looks, it would be a 10' beerometer. Where to buy CPH : Høkeren, Ravnsborggade 13, 2200 N.